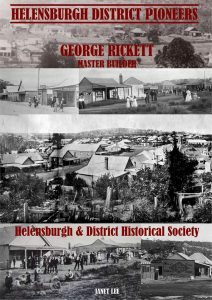 Helensburgh & District Historical Society is excited to release the first of our books on Helensburgh District Pioneers. Read all about George Rickett, Master Builder. George arrived in Helensburgh from England in the early part of our town’s development. He constructed many of Helensburgh’s early buildings, and some of the original Garrawarra Hospital buildings. He also became a Councillor on the Bulli Shire Council. An interesting read, with lots of historical photographs. $15 plus Postage. To order, see our Merchandise page.